When someone you know experiences a loss it can be hard to know what to say and do. 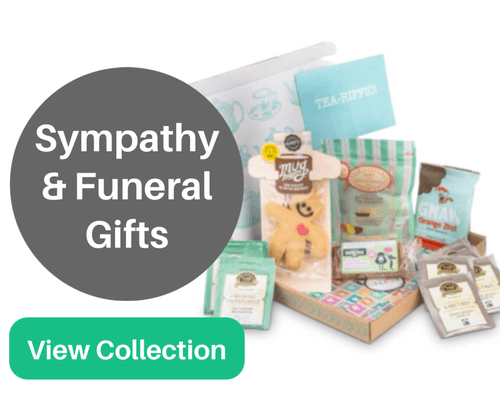 You may have already sent a sympathy card with message or bouquet of flowers but want to help and offer your support further, but aren’t sure how, and definitely don’t want to end up offending them. This is understandable but shouldn’t stop you from trying to be there for a friend or family member when they need it most. Whilst it’s a minor problem compared to what they’re going through it’s not a bad thing to consider the best way you can be there for them. If you get it right then they will appreciate greatly from the comfort feeling like they’re not alone. So to avoid any awkwardness or worsening of their grief follow the steps and recommendations below. Your support can be a huge benefit to helping someone through one of the hardest periods they will experience. Get it right and you will be an invaluable source of strength and comfort to them. But mainly, more than anything else, just remember to be there for them. You are probably more concerned with what you should and shouldn’t be saying but knowing when to just sit and listen to them is important. Let them express their grief. Don’t attempt to change the subject and avoid talking about what you think they will find uncomfortable. Allow them to make that decision. If they want to talk about their loved one then they should. They may feel the need to keep them from being forgotten. So whilst you shouldn’t pressure them to talk freely about their loss if they don’t want to you should let them know you are their to listen if they wish to. Just listen and let them talk. Don’t be afraid of silence either. Don’t try to change or avoid the subject of their loss. If they are want to and are comfortable with talking about it then let them. Do not force them to open up. Like the questions above let them know your there for them but it should all be at their own pace. Following on from listening you should accept that silence will be a big part of comforting someone who’s grieving. They will often not want to talk, but just having someone their with them will be of comfort. You don’t have to say anything but offer some nonverbal gestures that show your support – holding or squeezing their hand, hugging them etc. Don’t expect them to follow a pattern or timeframe for grieving. There is no correct or normal way to grieve. It will differ from person to person in the way they experience it. Whilst the more common timeframe for grief is between 18 and 24 months this can be much shorter or longer depending on the individual. So avoid pressuring or expecting them to be ready to move on if you feel they are taking too long. Only they can make that decision and will know when the time is right. You are likely to do more harm than good by saying anything. Grief is a complex and incredibly difficult time for anyone experiencing it. The ways in which people react during grief will differ and could involve extreme emotions, outbursts and behaviour. Instead of judging their actions or believing what they are doing is wrong make sure you reassure them that this is common for anyone grieving. They will take comfort from feeling they are not unusual or different in the way they are behaving and acting. And if they at any point they express anger or frustration towards you then do everything you can to avoid taking it personally. Grief can be overwhelming and during the process it can be hard to function normally. The thought of doing everyday tasks might seem near impossible. Offering to cook for them. Alternatively cook at yours and bring round food to them. This may not be appropriate at first but as time goes by then a bereaved person will have lots of free time on their hands. They may want time to be left alone but they might also want friendship and distractions. Getting out and doing more “normal” activities can help to begin moving on and alleviating some of the grief. You could offer to take them to the cinema, get a cup of coffee or just go for a walk. However remember not to pressure or push them. If they aren’t ready yet then just leave it for the time being and try again at a later date. If you’ve also experienced a loss it can be beneficial to share your story with the bereaved. Having someone else that has been through a similar situation can be comforting. It also helps to know that eventually the grief will pass and recovery will happen. By sharing your own experience it can help to make that seem possible. There are a few things you should always avoid saying to someone grieving. These could end up causing great offence or worsening the grief. There is never a good time to lose a loved one, whatever their age. You may believe this but the bereaved almost certainly won’t. They will be mourning their loss and do anything to have that person back. It’s a deeply inappropriate thing to say. There is no time limit for grief and whilst you might feel they should be moving on they may need more time. Let them get through it at their own speed without any pressure from you or others. This may be acceptable to someone religious (although even then it might not), but for anyone else it will be very inappropriate. They won’t feel like the death of their loved one is part of any “plan”. Don’t compare their loss to that of a pet. Whilst you may consider them to be similar there is a good chance they will find this very offensive. Over the longer term try to remember that whilst the grief may appear to have gone it can be triggered and return by various things. Major landmarks are often tough times for anyone who has lost a loved one, so make a note of them to offer support again. Birthdays and anniversaries are the most common but anytime you think it might be tough for someone is worth trying to remember and making the effort to support them. As grieving has no set time period then it can last as long as it takes. With that in mind you will want to ensure that you continue to provide support and assurance throughout the entire grieving period. Stay in contact on a regular basis. You don’t have to make it obvious about being there for them but just stay as a constant presence so they know they have someone to turn to. This becomes even more important once the funeral and initial stage of mourning is over. And finally remember that the grief of a loved one stays with you forever. Acceptance will probably happen, and a coming to terms with the loss over time, but the pain will always be there. Keep this in mind in however you choose to support someone. Sending an email, letter or text/SMS message is acceptable. If you find it hard talking face to face then this can be a good way to stay in touch and offer some support. If you promise to do something then make sure you keep it. Being let down during a time of grief can be devastating. Appearances can be deceiving. Just because on the surface someone looks to be coping well doesn't mean they aren't struggling beneath. Allow them to let down this guard and show their real feelings. A child will experience grief in a similar way to adults but may require further support and reassurance. 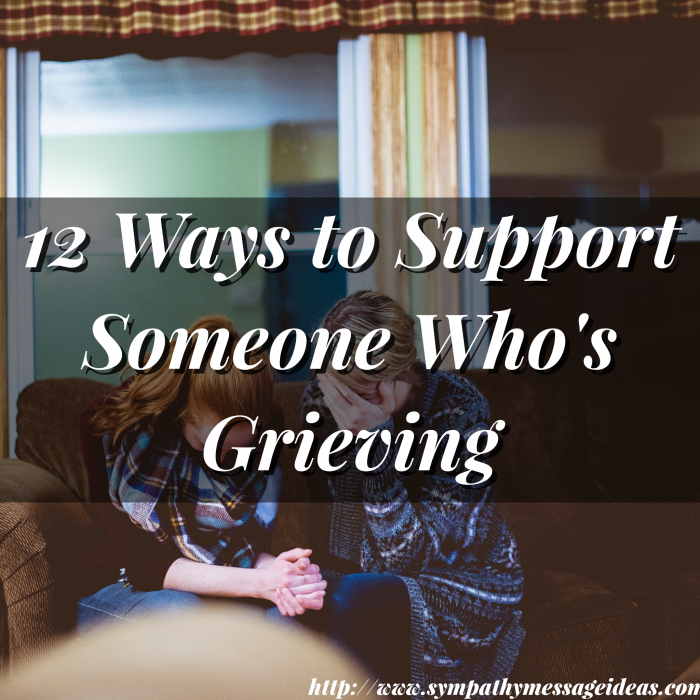 They take their cues from the adults they are surrounded by so make sure to show that grieving is normal and encourage them to do so. Be as clear as you can as to what has happened and ensure they don’t feel to blame in any way. If they have questions answer them as fully as honestly as possible. Grief will cause feelings of depression and misery but these should pass with time. If they don’t or they are actually getting worse over time then it’s possible their grief had turned into something more serious. In the U.S. call 1-800-273-TALK (8255).